Education today has its fair share of naysayers; if we don’t share the positive things happening in our schools, who will? When Jamie Vollmer, author of Schools Cannot Do It Alone, spoke at our local intermediate school district, he really got me thinking about sharing my story as an educator. Given the choice between spending time “explaining and defending what others thought was happening in school” and actively reaching out with social media to “let the public in to see what is happening first hand,” I definitely prefer the latter! Social media has changed the landscape of the world we live in; for students and parents, school is a substantial part of that world. What better way to engage students than teaching them to share and celebrate appropriately through social media? When I made the transition from teaching PE and computers to a middle-school principal, I became even more excited about motivating students by showcasing their work with social media. I immediately began to showcase the great things our staff and students were doing each day. Whether I posted about a daily lesson, our cow eye dissections, or simply photos of students having fun with friends at lunch; parents, community members, and other followers were able to see what life is like at our school. The hashtag (formerly known as the number sign or the pound sign) is used on social by creators and followers to identify text and media about a location or event and to share common thoughts. The hashtag is common across platforms like Twitter, Facebook, and Instagram. Last year we used #bulldogpride1415 to represent our school year; this year we switched to #ravennaprideRPS. #bulldogpride1415 was a great way to tag items throughout that school year, but it didn’t help us create an online community that could span multiple school years. Before you settle on a hashtag, search online social media sources to see if others are already using the words you are considering. You want to be sure you aren’t sharing hashtags with an online community with values and interests that are very different from yours! Our #ravennaprideRPS hashtag hangs in our classrooms and in the hallways of our school. I work hard to lead the way sharing our story on social media, and I encourage students and staff to post positive images and text about our school and other school-related activities. What to Capture and What to Share? We began by capturing just about everything, from goggle-wearing making science-lab slime to blurry shots of students burning off energy during recess. As we began to capture and share the daily happenings in our school, it became very clear how hard our teachers work each day to make learning engaging and fun. Soon teachers began showing students how to augment their projects with apps that create mini videos set to music. We launched a YouTube channel to showcase things like the explosions of student-made volcanoes. Instead of asking how the project went, our parents learned they could log on and watch their child in action, and the community benefited from this virtual window into our classrooms. To help us connect and reconnect with our successes, we also developed our Digital Hallway, a space lined with photos of an event or learning opportunity, a title, and a QR code. Scanning the code leads viewers to students laughing, taking part in an all-school assembly, and more. The codes were also shared at our parent-teacher conferences so parents could view the clips while they waited to talk to teachers. I regularly post blog entries to share photos and videos of happenings at our school. I anchor the blog with a short narrative of recent events and share a quick glance at the calendar for the upcoming weeks. I also feature links to Twitter posts and images, articles for parents and teachers, and cool sites related to education, ed tech, and life in Michigan. Editor's Note: Check out how Ronnie Mosher, the Principal at Wood Creek Elementary School in Katy, Texas keeps his community connected to school through his highly engaging video blog (VLOG)! I encourage our staff to send me photos I can include in my blog, allowing me to show off their great work even if they aren't quite ready to do so on their own. I capture and post their successes in the classroom and on the field, or court, or pool to lead by example and nudge them to try something that might be a bit beyond their comfort zone. We teach our students to ask permission before they post, and we model the same behavior at school. We include a permission slip with each student's enrollment paperwork to obtain parental consent to use their child's likeness in photographs or video. This ensures that we don't inadvertently post student images without parental permission. Be sure to check your district’s acceptable use policy before jumping in. You may want to explore a range of social media guidelines and samples of how other schools and districts craft permission for their media and use releases. Take advantage of the many apps available to make posting easy. If you carry your smart phone with you all day like I do, start by installing the Twitter and Facebook apps. 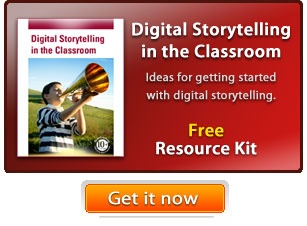 Get comfortable with the process of using them to capture and share the learning at your school. Once you're Facebooking and Tweeting like a pro, it's time to branch out. There are countless apps for phones, tablets, and computers that let you combine images, add captions, and more. Here are some of fun apps that make my posts stand out; they all connect easily to my social media accounts. Check in regularly with teachers and students about what you are sharing and what other things you could be sharing. Even if you aren’t sure of your storyline before you start working on a post, a narrative will appear as you review the events you plan to share. Work to clarify the story you are telling, and be sure to include enough media to help you illustrate your post. By making social media your friend, you can break down the barriers between your school and your community, model appropriate and effective use of these powerful tools, and develop your storytelling and tech skills. Mindy Lynch (@LynchMindy) is the Principal at Ravenna Middle School, in Ravenna, Michigan. An avid basketball player and cook, Mindy has also had the opportunity to share her passion for students, staff and educational technology at MACUL, Boyne Tech Conference, Grand Valley State University and Learning on the Lakeshore.